Join this open-air, London style double-decker bus tour that allows you to see America's Capital City when she's at her most beautiful: by twilight! On this tour, you'll visit Washington's most stunning historic sights, including the Jefferson Memorial on the Tidal Basin, Washington Monument, Lincoln Memorial, FDR Memorial, and those commemorating the Vietnam War, Korean War, World War II and the raising of the flag on Iwo Jima. Explore the famous landmarks and monuments of Washington, DC on this guided, 3-hour bicycle tour. As the sun sets over the National Mall, pedal through the major monuments and memorials. Travel through the National Mall, visiting the Thomas Jefferson Memorial, the Lincoln Memorial, the Franklin Delano Roosevelt Memorial, the Vietnam Veteran's Memorial, the Martin Luther King Jr. Memorial and more as they light up for the night. 'Along the way, hear historical facts, funny stories, and anecdotes from the guide. Helmet and bike are included. Explore the famous monuments and war memorials of Washington, DC after dark on this private, 4-hour, sightseeing and dinner tour. Before the tour, enjoy'a 2-hour dinner at any DC restaurant of choice (own expense). Then hop aboard a comfortable van and experience an educational and entertaining narrated history of the nation's capital. See the White House and the United States Capitol, plus the Lincoln Memorial, the Vietnam Veterans Memorial, the Martin Luther King, Jr. Memorial, the National Mall, and more. The itinerary will be customized to individual preferences. You haven't seen Washington DC until you seen it under the moonlight.' Visit our nation's most famous political building: The US Capitol.' Gaze upon the dome from the east front lawn and view the beautiful lighting of the World War II Memorial honoring.' Get an up close and personal view of the Lincoln Memorial as our former president sits tall, gazing at reflecting pool. This is a one of kind experience seeing the great memorials illuminated at night. Explore the famous monuments and memorials of Washington, DC at night on this guided, 3-hour, small-group sightseeing tour. Hop on board a motor coach or open-air bus and enjoy an educational and entertaining narrated history of the nation's capital. Visit the famous memorials and monuments, with an illuminated view of the Washington Monument, the White House, the Lincoln Memorial, and many other popular points of interest. This 2.5 hour small group walking tour through Washington DC's most popular sites will introduce you to the wars and presidents that have helped shape the United States. Explore the city at night when the monuments are illuminated to perfection. The tour, led by one of our entertaining young guides, welcomes up to 10 guests. This nightly small group bus tour is 30 minutes longer than most other companies ensuring all guests an epic evening in Washington DC. It offers the flexibility to visit all the major attractions without feeling rushed from place to place. With this local tour operator all tours come with incredible stories that are given with passion &amp; personality! Hear the story of President Lincoln's assassination during this 2-hour shared walking tour in Washington DC. Your guide will share historical'photographs and anecdotes to set the scene as you stop at Lafayette Square Park, St. John's Church, and Ford's Theater. It is a story filled with intrigue, mystery and betrayal. 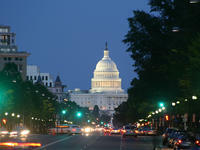 Explore the popular monuments in Washington, DC with this guided, 3-hour tour of the National Mall at night. Hop aboard a deluxe motor coach and enjoy an educational and entertaining narrated history of the nation's capital. Stop at the White House and United States Capitol, as well as the Lincoln Memorial, the Vietnam Veterans Memorial, the Martin Luther King, Jr. Memorial, and many more. Local hotel pickup included.